There seems to be an emerging trend of people attempting to pay tribute to the stars of the Fast and Furious franchise (not that you’ll hear us complaining about it, mind you). First, two very chill and righteous dudes attended a city council meeting in San Clemente, California, to advocate for the building of a statue honoring the late Paul Walker. 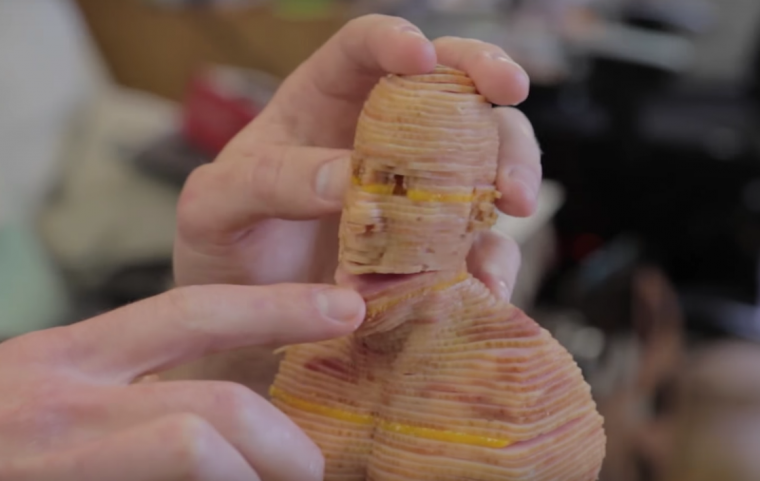 And now, a YouTube personality has crafted a sculpture of series star Vin Diesel—one made entirely out of lunchmeat and cheddar slices. Ingenious and delicious, to be sure, but this sandwich does beg the question: why? Is it some sort of commentary on Vin Diesel’s often “ham-handed” acting? Is it a play on the “cheesy” dialogue featured in the carsploitation flicks? Is it a reference to the “beef” between Diesel and his F8 of the Furious co-star Dwayne “The Rock” Johnson? Ultimately, who knows what inspired YouTube commenter Restroom Sounds to request a bust of Vin Diesel using laser-cut cross sections of sliced ham. Frankly, we probably shouldn’t try and wade too far into the murky waters of Restroom Sounds’ mind. Surely, he has his reasons. All we can say for certain is that he’s happy, and frankly, so are we.